The Army-Navy game is one of college football's most storied rivalries. The Black Knights and Midshipmen first battled on the gridiron way back in 1890 on "The Plain" at West Point. On Saturday, the teams will meet at Lincoln Financial Field in Philadelphia for the 116th iteration of their historic competition. While the heated pigskin rivalry dates back to the late-19th century, the military academies have been contributing to America's pastime even longer than that. Mitch Harris appeared in 26 games for the 2015 Cardinals and pitched to a 3.67 ERA with 15 strikeouts over 27 innings. He finished seven games, walked 13 batters and, oh, yeah, did we mention that he served five years in the U.S. Navy and achieved the rank of lieutenant before being granted release? Harris was a two-way star for the Navy Midshipmen as he led the team in RBIs, doubles, triples and slugging percentage during his junior season while setting a Patriot League record 119 strikeouts on the mound. The Braves selected Harris in the 2007 MLB Draft, but Harris didn't sign. The Cards drafted him the following season and inked Harris to a professional contract, but their new pitcher had to delay the start of his professional career to serve his country. Stationed in Virginia, Harris was deployed three times: Once to the Persian Gulf, once near Russia and once to South America. When he completed his five years of service, Harris returned to baseball and joined the Cardinals organization, climbing the Minor League ranks to make his MLB debut last season. He is the first graduate of any military academy to earn an MLB win. "I knew it was going to be hyped up and a big deal, but I didn't realize how big, I guess," said Harris, who rejoined the organization in 2013 after completing his service requirements and became the first graduate of the Naval Academy in 94 years to appear in a Major League game. "Again, I love the story. It's a part of who I am. But that's not the goal. The goal is to go out and perform well." The O's selected Drake in the 43rd round of the 2008 MLB Draft (the same one in which the Cards selected Harris). Drake signed with the O's after his sophomore year, so he didn't need to petition the Navy -- the process that postponed Harris' MLB arrival -- to begin his professional baseball career. Like Harris, Drake made his MLB debut last season. He appeared in 13 games for the O's and pitched to a 2.87 ERA, striking out 17 over 15 2/3 innings of work. General MacArthur is best known for commanding the Allies in the Pacific Theater during World War II,, in which he defended the Phillipines and eventually accepted Japan's surrender in 1945. But 40-some years prior to that General MacArthur was busy finishing at the top of his class at West Point, where he stood out as a baseball star. One play of his stands out above the rest, as MacArthur played right field in the 1902 Army-Navy game and tracked down a ball hit so deep that the left fielder came over to be the relay man. MacArthur hit him with a strike and the relay throw nailed the runner at the plate to prevent an inside-the-park home run. 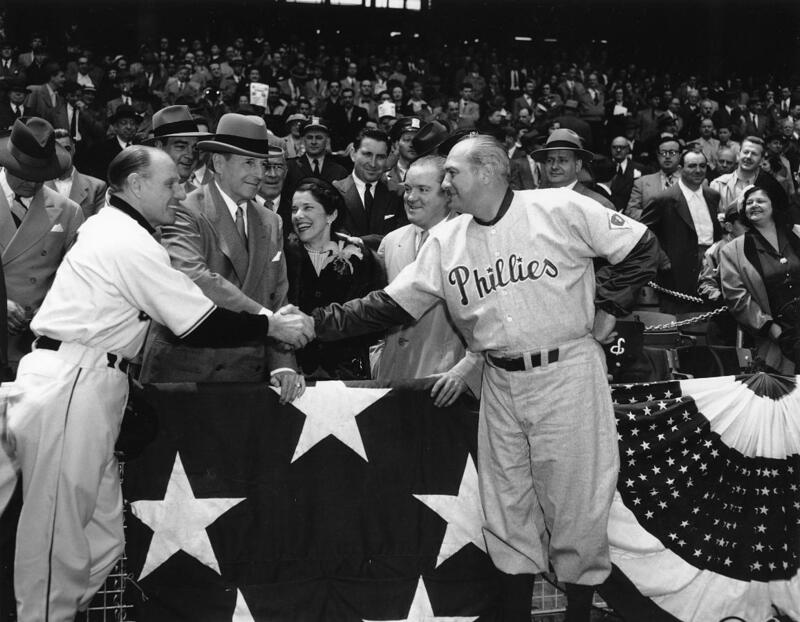 MacArthur went 1-for-3 that day, and remained a baseball fan for the rest of his life. He famously saw a dozen or so games at Ebbets Field, including one after his ticker-tape parade through New York City to celebrate his return from the Korean War in 1951. In 1961, MacArthur was asked to be the Commissioner of Baseball, but he turned it down. President Dwight D. Eisenhower aka Junction City center fielder "Wilson"? Dwight D. Eisenhower took the oath of office on Jan. 20, 1953, to become the 34th President of the United States. Prior to his stint in the Oval Office, Ike had been a five-star General of the U.S. Army during World War II and served as Supreme Commander of the Allied Forces in Europe. Before that, he had been a small-ish outfielder who was cut from the West Point baseball team. President Eisenhower played football while at West Point, but said that failing to make the baseball team was one of the great disappointments of his life. There's a bit of controversy surrounding Eisenhower's baseball career, as it's often contended that he played semi-pro ball prior to becoming a cadet at West Point, which would have made him ineligible to play college football. The old legend says that Eisenhower -- who grew up in the small town of Abeiline, Kan. -- played center field for the 1911 Juction City Soldiers of the Central Kansas League under the alias "Wilson." According to Baseball-Reference, the Soldiers employed an outfielder named "Wilson?" who went 11-for-31 nine games that season. President Eisenhower supposedly let the cat out of the bag about his semi-pro career while swapping stories with Hall of Famer and then-Giants manager Mel Ott. From June 26-July 16, 1921, Naval Academy graduate Nemo Gaines pitched out of the bullpen for the Washington Senators. Though Gaines pitched in four games over that stretch, he never had the chance to relieve Johnson, who pitched complete games in every start he made during Gaines' tenure with the Senators. Gaines surrendered five hits and struck out one batter over 4 2/3 innings in his four appearances. He never gave up an MLB run and -- for the next 94 seasons -- was the only Naval Academy graduate to appear in the big leagues. Abner Doubleday fired the first cannon shot in defense of Fort Sumter, which marked the official beginning of the Civil War in 1861. Doubleday grew up in Cooperstown, N.Y., and later graduated from the United States Military Academy in 1842. In the early 20th century, National League president Abraham G. Mills sought to formally investigate the origin of baseball and, in the subsequent Mills Commission, ruled that Doubleday had invented the game in a New York cow pasture in the warm months of 1839. Though that origin story for America's pastime has long since been debunked, the National Baseball Hall of Fame remains in Cooperstown, where it was situated for Doubleday's honor. Ditto for West Point's Doubleday Field, where the Army Black Knights play their home baseball games.